Will taxpayers owe more or less in their tax bill next year? Now that the 2017 tax season is in the rear view mirror, it’s time to look ahead to 2018. After the most dramatic changes to the nation’s tax code in over 30 years, many taxpayers are wondering how the Tax Cuts and Jobs Act (TCJA) will affect next year’s tax return. The Tax Policy Center analyzed the impact of the TCJA and found that, on average, income taxes will be reduced across income groups in all states. The individual tax cut is estimated to average 1.8%, the study found. Still, nearly one third of taxpayers will see no change in their tax bills, and a smaller portion of filers will owe more next year. 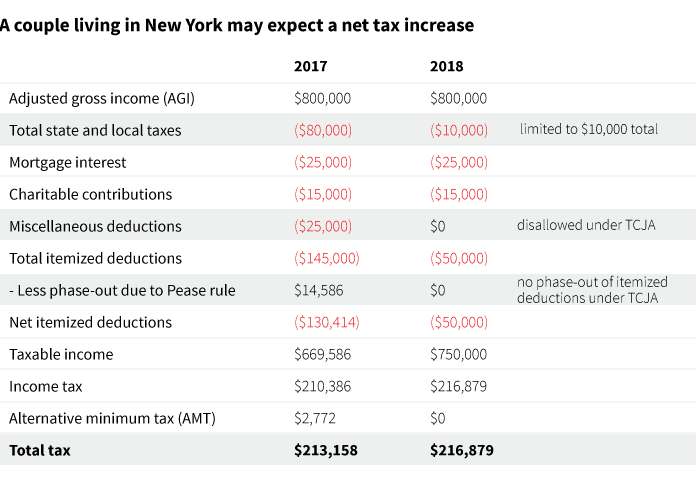 For higher-income taxpayers (defined as in the top quintile) who will see a higher tax bill, the average tax increase is expected to be roughly $8,000. Who is more likely to have a higher bill? The impact also varies by state. Taxpayers living in areas with high state and local taxes, such as California, Connecticut, New York, New Jersey, Maryland, and Washington D.C., are more likely to have a higher tax bill than those living in other states. In addition, residents in parts of Illinois, Massachusetts, and Oregon may face a higher tax bill. Taxpayers who may have had large miscellaneous deductions in the past may also need to pay more taxes next year. These may include unreimbursed business expenses as an employee, which is among many deductions repealed by the tax law. Consider this example of a couple living in a high-tax state.